I, Tonya is the biopic starring Margot Robbie that nobody asked for, but we somehow never realized we all wanted to see. The film explores the events leading up to the infamous “incident” involving American figure skater Tonya Harding (played by Robbie) and her fellow American rival Nancy Kerrigan (Caitlin Carver). It was an incident that unexpectedly shook up the normally “ladylike world of figure skating and made it the main event at the 1994 Lillehammer winter Olympics, an extra Olympics that was added just two years after the French as the event made the switch over to its current alternating two-year cycle between the winter and summer. The film starts from Harding’s young years as a skater on the rinks in Portland, Oregon, surviving her working-class roots and tough as nails and often abusive mother LaVona (Allison Janney in a brilliant supporting role) to make her way into the demure – and pricey – world of skating. It tells the story from multiple and often conflicting perspectives based on various, true interviews of Hardy’s marriage to her abusive husband Jeff (Sebastian Stan) and the circumstances that would keep drawing her to both make and inadvertently fall into bad situations – the worst of which being a conspiracy to injure Nancy Kerrigan before the U.S. Olympic trials. 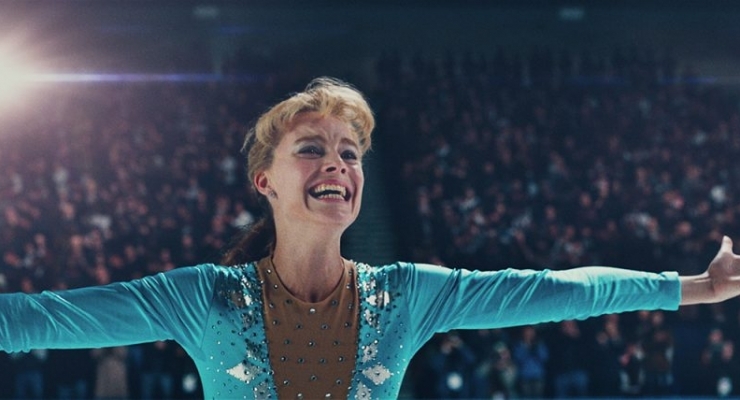 Part biopic and part dark comedy that plays like a Scorsese film, I, Tonya is good because it never tries to make any excuses for Harding’s behavior, but rather presents a well-rounded offering of Harding the person and not Harding the tabloid fodder. Robbie’s depiction of Harding is stupendous and rightfully earned her an Oscar nod for Best Actress. She’s rough, rugged, bus also vulnerable when need be. And Craig Gillespie’s direction keeps the chaotic events together effectively with just the right amount of kinetic energy and a good use of period effects to place us in the era. I, Tonya was shot mostly on 35mm Kodak Vision3 500T 5219 film stock with Arricam LT and Arriflex 235 cameras, with some scenes being shot digitally on the Arri Alexa 65 at 6.5K resolution. A 4K digital intermediate was used in post-processing for the master that this Blu-ray was taken from. It arrives in an AVC 1080p encodement framed at 2.39:1. Given the artistic choices of the film, which often goes for a soft or oversaturated period look or even the look of vintage video footage, it doesn’t always look the greatest, but it is more than competent and certainly devoid of unwanted flaws, color banding, or compression noise. The English DTS-HD Master Audio 5.1 mix for I, Tonya rocks out with the multitude of classic rock songs on the soundtrack getting lots breathing room, midrange ‘punch’, and plenty of ambience. The dialogue is crystal clear and despite being a little front-heavy, the mix never feels boring. The disc comes with a solid slate of ‘making of’ special features on Blu-ray including a feature commentary with the director, nearly 20-minutes of deleted scenes, and over 15-minutes of behind the scenes featurettes that cover the production of the film and include lots of interviews with the cast and crew. If you didn’t live through the era, you’d be hard-pressed to understand just what a media circus the otherwise low-key figure skating world had tuned into thanks to “the incident” involving Nancy Kerrigan and Tony Harding. This film is only a snapshot of that, but on some level, also a commentary on how the media itself can ruin someone’s life. This is a solid film that, like the events that took place which it depicts, feels almost unreal. In this comedy/biopic infamous figure skater Tonya Harding (Margot Robbie) rises from her working-class roots amidst poverty, domestic abuse, and a bad marriage, to become a star of the American figure skating world only to find herself caught up in a scandal caused by poor choices and the people surrounding her when her rival Nancy Kerrigan is attacked ahead of the 1994 Olympic trials. Margot Robbie's portrayal is brilliant and the film is a fine balance of kinetic energy, gritty rock and roll, and sad commentary on the tabloid media. The Blu-ray offers a satisfying presentation.